George Moncur made his Posh debut against Swindon as a second-half substitute. Photo: Joe Dent/theposh.com. 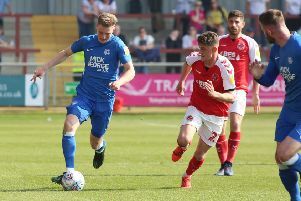 McCann felt the draw against a slick-passing Swindon side was a fair result and he claimed there were exceptional individual displays from Marcus Maddison, who added a goal and an assist to his impressive start to the season, and emergency right-back Jermaine Anderson. On-loan winger Nathan Oduwa made his Posh debut as a substitute against Swindon. Photo: Joe Dent/theposh.com. But the Posh boss wasn’t happy with the decision to award the visitors a penalty early in the second for a handball offence against Michael Bostwick or with the speed of his side’s passing around the Swindon penalty area. Posh led twice in the gamre through a Gwion Edwards header - his fourth goal of the season - and a Maddison penalty, but a Jack Baldwin own goal eventually handed Swindon a deserved share of the points. McCann said: “Ultimately it was a fair result, but I was a bit frustrated with the penalty Swindon were given which enabled them to make it 1-1. That was the big disappointment from the game from my point of view. “Michael has tried all he could to get his hands out of the way of the ball. He wasn’t looking at the ball when it hit him so it couldn’t have been deliberate. I felt we were hard done by in that moment and the Swindon manager agreed with me. Normally the home team gets the benefit of the doubt with decisions like that, but not this time. “If we could have gone 2-0 ahead there is no doubt we would have won the game and we had a chance to do that before they were given athe penalty, but we weren’t clinical enough around today. “We didn’t pass the ball quickly enough when we found ourselves on the edge of their area. George Moncur showed us how to do it when he came on which is why he ended up at a Championship club in the summer. “But there were outstanding individual displays in our team which I really want to focus on. Marcus Maddison was exceptional. He is really learning all parts of his role and that includes the defensive part. “And Jermaine Anderson looked like a right-back today which is proof of what a talented footballer we have in our squad. “It made me a laugh a couple of weeks ago when I heard criticism of Jermaine. He is one of the best midfielders in League One and he is one of the best in his position for his age in the country. He showed his power and his ability in an unfamiliar position today. “It’s quite scary, and it disappoints me, that some of the club’s own fans would give him so much flak. “We scored two good goals, but I was disappointed for our back four that we let two in. The defence put in a good shift and we’ve been undone by a penalty and an own goal. “I’ll have to look back at the video regarding the own goal to check on the positioning of Jack Baldwin and our goalkeeper and if anyone failed to track a runner. On-loan Spurs winger Nathan Oduwa, like Moncur, made his Posh debut as a second-half substitute today. Posh are next in League One action when Port Vale visit the ABAX Stadium next Saturday (September 10). Michael Smith will be back from international duty to play in that game and fellow right-back Hayden White should also be availeble after missing the last two matches with a groin injury. “We set ourselves a target before the MK Dons game last week (August 27) of nine points from three games, but we’ll take seven so we need a good performance against Vale next week. Smith is in the Northern Ireland squad tackling Czech Republic in a World Cup qualifier in Prague tomorrow.